Quinnipiac returned to the NCAA tournament for the first time since losing the 2016 National Championship game to North Dakota. After not playing in two weeks due to a stunning quarterfinal loss, Quinnipiac got back on the ice against a team that had not played in almost a month when they met independent Arizona State. 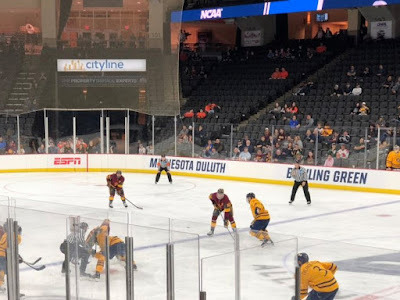 The Sun Devils in just their fourth season of Division I play and their third with a full Division I schedule gave Quinnipiac all it could handle down the stretch as the Bobcats hung on to defeat the Sun Devils 2-1 in the Midwest Regional Semifinals. Here are my thoughts and observations from the win over Arizona State. - Quinnipiac advances to its third regional final in program history as it survived tournament newcomer Arizona State 2-1 on Saturday night in Allentown, PA. Despite Quinnipiac dominating Arizona State on shots 38-21, this game was much closer and was a total nail biter at the end. The Bobcats had to hang on for dear life and they caught a break late when Jarrod Gourley was given a major penalty from a hit from behind on Nick Jermain. This was a critical play as the Sun Devils were swarming up to that point and for the Bobcats to finish the game on the man advantage was huge as it bought them some time to milk the clock a bit until Arizona State had to pull goaltender Joey Daccord. - This was not a great effort from Quinnipiac at times outside of the second period. They got a gift first goal by Joe O'Connor when Joey Daccord was slow to react and the puck went five hole in between his legs. That is one that Daccord should have had and he will probably have trouble sleeping tonight as that goal was a difference maker in this one goal game. Daccord saved Arizona State in the second period when Quinnipiac out shot them 18-2 and while Quinnipiac got a single goal from William Fallstrom they could have really blown the doors open if it wasn't for Daccord. The third period was survival mode especially at the 11:42 mark when Brinson Pasichnuk got the Sun Devils within a goal. Arizona State really outplayed the Bobcats from that point on until the major penalty broke up the momentum. Had there been no major penalty, I could have seen Arizona State tying this game up as they were playing that well. - Quinnipiac did a really good job holding one of the best scorers in the country in Johnny Walker to just one shot. They bottled him up and frustrated him all night and did a good back checking on him. Keeping him off the score sheet was a big reason why Quinnipiac is moving on as he is extremely dangerous every time he touches the puck. - Outside of Joey Daccord, Arizona State defensemen Brinson Pasichnuk was the best player on the ice for the Sun Devils. He scored the first ever goal for the Sun Devils in the tournament and led them with six shots on goal. He was swarming in the third period as a he played some big minutes down the stretch as the Sun Devils shortened their bench in crunch time. - It was the third straight game for the Quinnipiac top line being held scoreless. Tufto, Bongiovanni and de Jong were held to just eight shots in the game against the Sun Devils. Against Minnesota Duluth, that line is going to need to show up if they want to reach of the Frozen Four in Buffalo as this line has accounted for 25% of the Bobcats offense this season. Tufto despite not getting on the stat sheet did a really good job tonight of winning 14 of 22 face offs including some critical ones late. - The Quinnipiac power play was 0 for 3 tonight and even the return of Chase Priskie didn't help it improve. The passing was poor and they got very few quality looks against the Sun Devils. This is a unit that has clearly struggled since the loss of Fortunato as the power play percentage is down over 10% since his loss. They need to figure out a way to get better looks especially against Minnesota Duluth tomorrow. - Speaking of Priskie, that was a quiet night for him with only one shot on goal. The captain had not played in 28 days since he was ejected in the Yale game and was suspended for the Brown series. Let's hope it was just a little rust he had to clear off and he will have a big effort in leading Quinnipiac to a possible Frozen Four trip. - Andrew Shortridge was good again tonight for Quinnipiac with 20 saves as he did what he needed to do against a pesky Arizona State team. He caught a huge break in the third period when the officials blew dead a play in which the puck was clearly loose in the crease. The play was reviewed to see if it possibly went across the goal line but it was clear it never crossed the line. It gave Quinnipiac a bit of a breather which they desperately needed. - I love when players like Joe O'Connor score goals. The third line winger hasn't scored a goal in over four months since November 23rd but he scored one of the biggest goals of the season tonight. This was only his third goal of the season O'Connor scoring just 3:54 into the game gave Quinnipiac the momentum it needed especially after the struggles of the Brown series. - Arizona State will be back in the NCAA tournament again in the near future. Greg Powers has done an unbelievable job elevating this program to a national contender in just four short years. Once they get a permanent rink and a possible conference, the sky is the limit with them. I hope that other PAC-12 schools were watching this and say to themselves that this could be them in a few years. - If Quinnipiac wants to advance to the Frozen Four in Buffalo they will have to play much better against Minnesota Duluth than they did on Saturday night along with having better skating legs late as I thought they really struggled to get the puck out of their own end in the third period. The Bulldogs are a totally different animal than the Sun Devils. They are the defending national champions and have been the Frozen Four the past two seasons and are the NCHC tournament champions. The Bulldogs needed a late goal to tie Bowling Green before dispatching the Falcons in overtime to advance to the Midwest Regional Final. The Bulldogs are loaded on the back end and have a top level goaltender in Hunter Shepard. They have one of the best coaches in Scott Sandelin as well. This will be the Bobcats first matchup ever with Minnesota Duluth and it won't be easy to knock out the defending champions. This is probably the toughest team Quinnipiac will have ever faced in a regional final. - Despite what happens tomorrow night, win or lose this season has been one of the most enjoyable to watch. Picked to finish 8th in the ECAC, this team has 26 wins and is on the door step of another Frozen Four appearance. I don't think anyone expected this team to reach a regional final with the amount of freshman they are playing every night. The future is bright in Hamden.